Watching football is stressful if you’re invested in one of the teams. I was laughed at as I repeated, “Oh, my God!” over and over when I thought something bad might happen. In other words, constantly. And that was just during the first drive. Not wanting to be laughed at further, I spent a good portion of yesterday’s game between the Packers and the Bears with my head hidden under a quilt, peeking out here and there when I thought it was safe. If my head was under a quilt, I reasoned, I wouldn’t panic so much during every. single. play. I have to admit, the other reason I started to quiet down is because my throat hurt. I spent a good portion of the game with a cough drop in my mouth, hoping to ward off the cold that threatened. At this point, things could go either way. 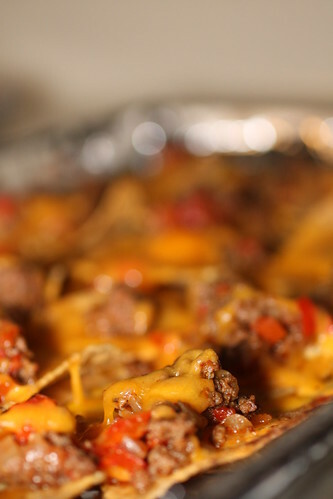 Though I didn’t have these nachos yesterday, they’ve often graced my plate during a sporting event (and just might make an appearance during the Super Bowl). They’re incredibly fast and easy to make, because they rely on leftover taco meat, which I nearly always have a container of in my freezer. Preheat broiler. Lay chips out flat on baking sheet. (For easier clean-up, line sheet with foil.) 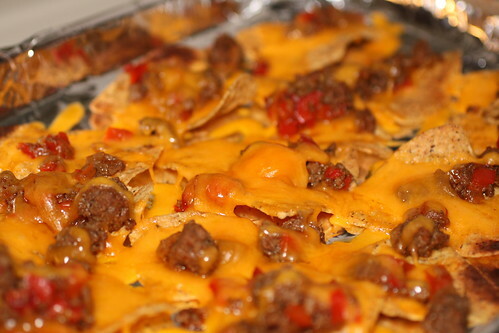 Top chips with a spoonful of taco meat and/or refried beans, then cover with shredded cheese. Broil until the cheese is melted and bubbly. Serve with desired condiments and toppings. *Avoid bags of preshredded cheese; it’s tossed with an anti-caking powder that prevents the cheese from melting as well. It’s worth the extra few minutes to buy a block of cheese and shred it yourself. Can you imagine what I’ll be like during the Super Bowl?? ?